The goal of my website is to educate the public by providing a tool to help identify aquatic invasive species (AIS) and fish species (Larval & Adult) like Sea Lamprey, Tubenose and Round Gobies, Ruffe, Zebra Mussels, Quagga Mussels, Alewives, White Perch, Asian clams, and Asian carp, all of which threaten the Great Lakes. Even though there have been studies of ichthyoplankton distribution in the Great Lakes Basin in the past, there is a lack of recent research regarding identifying larval fish identification for just Lake Michigan. Auer (1982) and the Electric Power Research Institute (EPRI) do provide extensive physical descriptions and myomeres counts for larval fish, yet they lack the modern technology to provide realistic photos of the samples. From these resources, the detailed outlines of different larval stages can provide an educational outlook on specific physical features or myomere counts and high-quality photos can improve the detecting and monitoring of AIS. To promote future AIS research especially in larval fish identification, I developed my own logo to influence the public’s perception of the public towards this issue. In the logo, the two larval fish that are within Lake Michigan is a Round Goby and Common Carp (The two fish larvae photos below this paragraph). 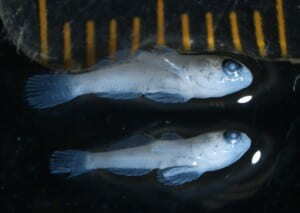 The dark blue color helps differentiate the larval common carp’s “Y” markings and the Round Goby’s large & fused pelvic fins. With the help of my website and AIS Logo, I hope that we can promote the communication and outreach of past and present AIS research, so Lake Michigan has a fighting chance to stop the spreading of AIS and save the largest freshwater system in the world. The importance of ichthyoplankton research was made clearer when Johan Hjort, a Norwegian fishery biologist, examined and better defined the meaning of the term “critical period” (Blaxter 1974). Hjort’s critical period concept discusses how the strength of the year-class is determined by the availability of food after the larval yolk supply has been exhausted (Blaxter 1974). He also touched on how natural forces can transport ichthyoplankton to low-quality environments leading to high mortality rates and low recruitment. Even though the survival curves of marine larval fish collected don’t justify an acceptance or rejection of Hjort’s concept, food availability and starvation are an important cause of larval mortality (Blaxter 1974). Larval species react differently to food availability since their feeding conditions will vary depending on the number environmental and species-specific factors. Although marine fish have been known to produce high densities of buoyant pelagic eggs, there is a lack of recent research involving distribution patterns of ichthyoplankton in Lake Michigan. The 2017 AIS EDM Program brought a new perspective to adult and larval fish diversity and distribution within the Lake Michigan drainage. 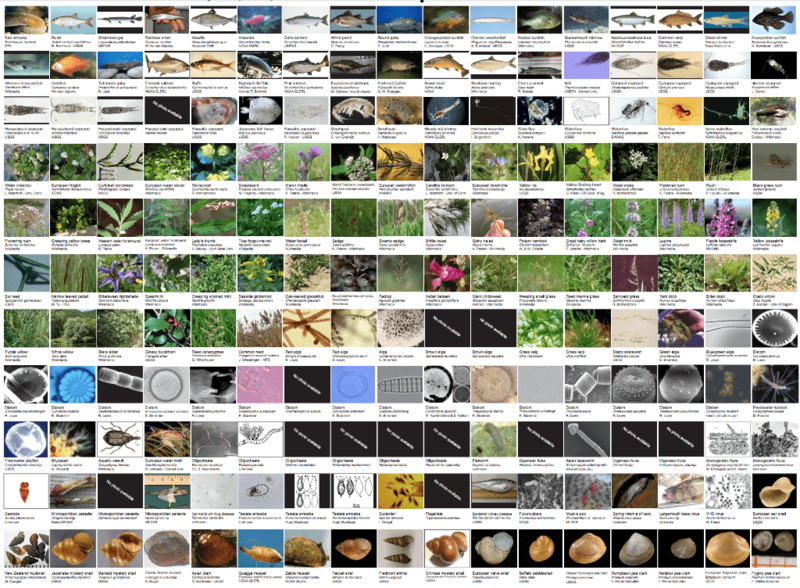 The website illustrates 29 species of larval fish that were collected and explains their physical characteristics and population dynamics. An important page for this website is the AIS Library. The visuals within the AIS Library enhance awareness of AIS detecting, monitoring, and reporting for all sectors of the community. The creation of this joint AIS Library will allow people from different backgrounds and education to better recognize and report AIS in Lake Michigan and decrease the negative impacts of AIS on the economy, ecology, recreation, and human health. I wanted to provide an educational tool combining the in-depth and common information to benefit future AIS reporting and research.